When you’re a therapist or coach specializing in working with people impacted by problems with sexuality or sexual issues, it’s inevitable that from time to time you get some—shall we say—interesting calls, texts, emails, and blog comments. Hello, if you need a hacker to figure out what your spouse is doing behind your back. Contact cyberhack— gmail com he has the key to your problem he helped me catch my cheating wife cause she don’t let me go close to her phone so I was referred to this great hacker who helped me break into her phone with out physical access to it. Except for the email address—which I edited—this is the exact blog comment, as it was written. If your ultimate goal is to get access to your spouse’s phone, then this might be all you want to do: hire a hacker, install monitoring software or a GPS tracking device on your spouse’s car, or track them in person in real time. But the reality is that when anyone contemplates taking any of these actions to find out more about their spouse’s activities—or in fact does hack into a spouse’s phone, email, or computer—they are seeking much more than information. The problem is that hacking and surveilling cannot and will not get you any of these. Of course, you might get some clarity about what your spouse has been up to online, and that is helpful information. But hacking, surveillance, or secret monitoring won’t restore honesty to your relationship, provide ongoing transparency, or give you what you’re after—which is ultimately intimate connection with your partner. When you know the essentials of good boundary work, you know that the first action to take when you want access to your spouse’s phone is to ask. If they say no to your request, you could start with being curious about why they don’t want to give you access. For example, your spouse may be planning a surprise for you that would be revealed if you had access to their phone or computer, or he needs to protect the private information of a friend, sponsor, or someone in his support community. If your spouse says no to your request, and has no reasonable explanation as to why, you would next need to determine how important it is to you. If you rate the importance as more than a 7 on a scale of 1-10, then you will probably want to take your boundary work to the next level. A next step could be to tell your spouse the impact their choice has on you. Do you feel fearful, angry, or distrustful? Do you interpret your spouse’s unwillingness to be transparent about his phone, for example, to mean that he doesn’t care about demonstrating his trustworthiness? Then you could tell him that. If, after having an honest conversation about the impact of his choices on you and how you feel about the relationship, your spouse is still unwilling to be more transparent, the next step could be a request to have a session with a counselor or therapist to talk about it and find a resolution. There are a number of directions this scenario could take from here—too complex to cover in one article. 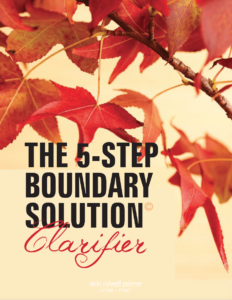 But no matter what happens next, each step of the process can be faced and managed when you have the knowledge, skills, and tools of effective boundary work. Boundaries bring clarity, build connection, and help you find out how far you’re willing to go with another person and how far they’re willing to go with you. Definitely more than you can get from a hacker. That was really good, and I found after reading your book and doing the boundary work that it really helps both people. Interestingly enough my husband WANTS me to look at his email/texts etc., but I don’t want to. I feel like not only do I not have time to “spy” on him, if he wants to continue cheating he’ll find away and me looking at his phone won’t prevent that. Even though I have full access to look at all his stuff, I don’t. It’s not the kind of obsessive life I want to lead. Although shortly after discovery I sure went through everything. Hi Heidi, thanks so much for sharing your experience. It is helpful for betrayed partners new to discovery to know that it is possible to not be caught in the obsession of checking or monitoring as you described. You are so right—”if he wants to continue cheating he’ll find away and me looking at his phone won’t prevent that”.